While the 1970s were known as the 'Me' Decade, this was also a time that saw great societal change: The Beatles split, President Richard Nixon resigned, and the Vietnam War finally ended. The period was also known for the birth of disco and punk rock, Sea Monkeys, Rubik's cubes and yes, even streaking. This era is still recent enough that many people remember a lot about it. At the same time, it's just distant enough to present trivia buffs with a challenge. Whether you lived through the 70s or you're just now enjoying them in retrospect, print out these trivia sheets and see how many questions you and your friends can answer. 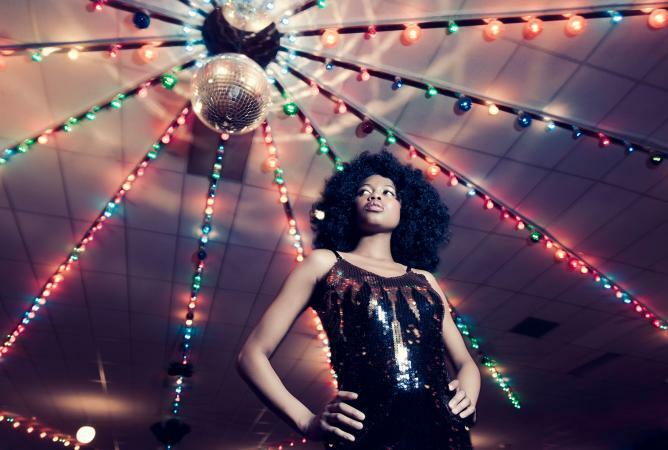 If you have a fondness for 70s culture, you're bound to enjoy this set of trivia questions. It's like opening up a time capsule to everyday life in that era. You'll find questions about popular fads, fashions, toys and more. Just to whet your appetite, take a look at a few sample questions. Who used to beg customers, "Please don't squeeze the Charmin?" Which inanimate "pet" reached its peak popularity during the 70s? Which toy answered user's questions with replies like, "It is certain" or "Reply hazy, try again?" Feel like you're ready to dive in? 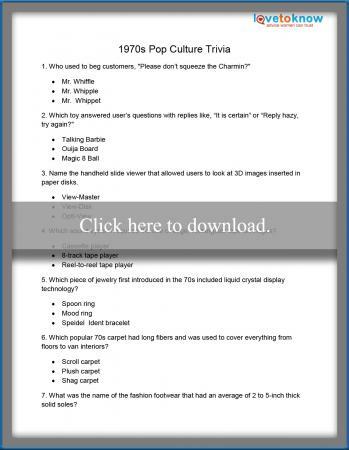 Go ahead and print out the full trivia sheet, but don't peek at the answers until you've answered all the questions. Are you a fan of vintage 70s television? This trivia set is filled with questions about all kinds of shows from sitcoms to dramas to those classic variety shows. Check out some of the questions. Which variety show ran from 1971-74 and featured comedy sketches and musical productions from a husband and wife recording team? Which show featured a character whose closest companion was a grizzly bear? Darren McGavin portrayed a reporter who investigated crimes of a supernatural nature in which TV show? Think you know enough to accept this trivia challenge? Print it out and put your knowledge to the test. However you feel about this decade, there's no denying that it was a glorious time for music. You'll find questions about the Grammys, classic albums, some of the most influential artists of the decade and more. Take a peek at a few questions from this set. Which year was Queen's epic hit Bohemian Rhapsody originally released? 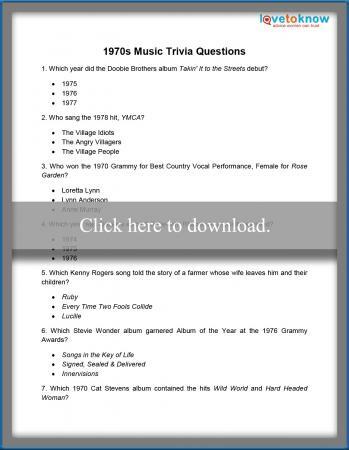 Which 1970 Cat Stevens album contained the hits Wild World and Hard Headed Woman? Which famous singer wrote Mott the Hoople's hit All the Young Dudes? If you want to see the full list of questions and answers, just download the printable. Double check your facts to make sure they are accurate. Keep a smartphone or tablet handy to recheck info in case your answers are challenged by others. Vary the difficulty of the questions so people don't get too discouraged trying to answer them. Keep all the trivia age appropriate. These trivia sets are great for gatherings. You might even decide to include them as part of the festivities for an entire 70s theme party. Once the disco-dancing ends and the cheese fondue and Chex mix have been eaten, encourage your guests to sit back with a Tab, some Country Time Lemonade, or maybe even a little Sangria, and let them test their 1970s knowledge.